Especially when renting a flat, you need to show your landlord your Schufa information / Schufa score. Here I show you how to get it for free, directly from your computer. Caution: The free Schufa report will take around 3 weeks or more until you receive it. If you need it earlier, you have to use the paid option. The Schufa is a central credit bureau in Germany. Basically, they know about your phone contract, your bank accounts and your debts. They know especially about debts that you did not pay back. They also calculate a score (Schufa-Score) that rates your creditworthiness. All this data about you is contained in a Schufa report (Schufa-Auskunft). Then you need to send the form per standard mail to the address written on the form. After around 3 weeks, you should receive their answer by standard mail. fill out your personal data: First name, Last name, birthdate, birth name (if different from current one), street, ZIP code, city. add your signature: by clicking on unterschreiben, a popup will open. There, you can sign using your mouse / trackpad. You can try and repeat you are happy with the result (rückgängig = Undo, neu beginnen = Restart). Then click speichern and the popup closes. Finally, you will a receive an e-mail with an activation link, which you need to click on. Now, Selbstauskunft will send an inquiry per fax with your data and your signature to the Schufa bureau, and you need to wait until they send your report to you by standard mail. 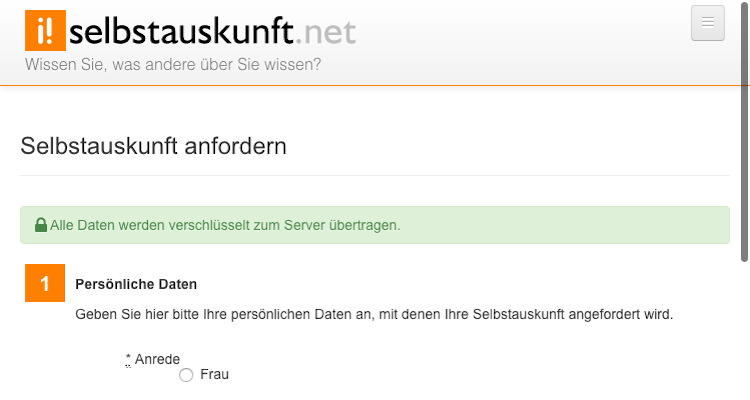 Selbstauskunft.net does not only offer creating inquiries for Schufa but also for a dozen other data holders about you. So you actually can go around and get all the data that German commercial databases contain about you.